Seribu Islands Regent, Husein Murad is releasing the animal health and qurban meat examination team officers from Marina Pier, Ancol, North Jakarta, Tuesday (8/21). They will monitor the slaughtering process and meat quality that will be shared to the people.
" This is to ensure that qurban animals are healthy and not dangerous to consume"
"Thank you to the officer who will run the duty. This is to ensure that qurban animals are healthy and not dangerous to consume," he stated. In the meantime, Seribu Islands Maritime, Agriculture and Food Security Sub-dept. Head, Sutrisno uttered that examination will be conducted before and after the animal slaughtering. 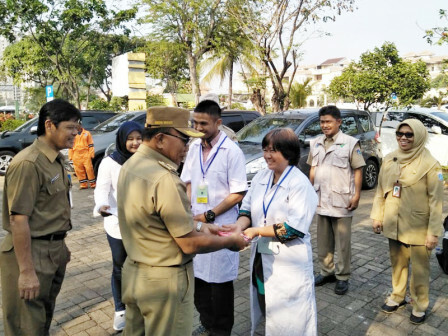 There are 21 officers in the field, starting from one veterinarian of the Indonesian Veterinarians Association (PDHI), nine students of the Faculty of Veterinary Medicine, Bogor Institute of Agriculture (FKH-IPB), and 11 officers of Seribu Islands Maritime, Agriculture and Food Security Sub-dept. "They will be spread to Pramuka Island, Untung Jawa Island, Lancang Island, Panggang Island, Tidung Island, Harapan Island, and Kelapa Island. They immediately conduct examination until tomorrow during animal slaughtering," he said.